For many years, Kerry lived in a diverse New York City neighborhood surrounded by people from different cultural backgrounds. So when she moved to Manchester, NH, she wasn’t used to being in a relatively small and more homogenous town. Kerry first heard about IINE when she attended a live performance of Suitcase Stories®, a show that highlights the experiences of immigrants and refugees in the United States. Since she lived just down the block from the IINE office, she decided to explore volunteering opportunities and attended an information session for the ESOL program. What Kerry didn’t know was that she was about to enter a uniquely diverse environment without ever crossing the street. From the beginning, Kerry found herself to be in a surprisingly familiar atmosphere. In the IINE classroom, she was surrounded by students from around the world, just as she had been in New York. Nearly twenty percent of residents in Manchester are non-English speakers, with Indo-European languages and Spanish as the most common foreign languages. Kerry relished the opportunity to hear their stories and learn about their cultural traditions. As she helped to lead small group activities and offered individual support to her students, her connection to the immigrant community grew. Her dedication and passion was soon noticed by IINE staff, who began to ask her to substitute for other volunteers whenever additional help was needed. 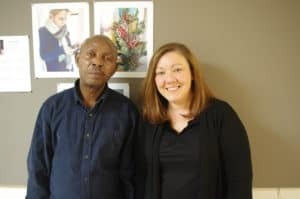 “Kerry first started volunteering once a week, but quickly found herself in the classroom three or four times every week,” recalled Shannon St. Pierre, Community Relations Manager at IINE. Eventually, Kerry was asked to volunteer for the weekend tutoring program, which provides individual attention to students preparing for certifications and job opportunities. This provided her the opportunity to contribute her own creativity to the classroom. For one student, she found a New York Times article that covered a business-related story in his homeland. Steering away from the conventional lesson plan, she brought it to one of their sessions as material for their lesson. Her student, who felt empowered and encouraged by her gesture, showed extra motivation to comprehend the article. From then on, Kerry has continued to bring her own resources to the classroom to connect students personally to their learning. Shannon also noted that volunteers play an integral role in resettling and stabilizing immigrants and refugees, as they offer students the opportunity to interact with community members outside of IINE staff. In turn, volunteers are consistently impressed by their students’ resilience and desire to learn English in the midst of their challenging life circumstances. Perhaps the most powerful part of the experience for volunteers is discovering that they are there not only to teach, but to learn from their students about different worldviews and cultures. To find out more about how you can volunteer with the International Institute, please join us at one of our Volunteer Informational Sessions, which are held from 6:00 PM – 7:00 PM on the last Monday of each month in Manchester, NH, and quarterly in Boston, MA and Lowell, MA.